Today on the blog I take a closer look at the Suede and Satin finishes. First up is Suede, often mistaken for a matte finish polish, the suede finish is it's newer hipper cousin. The one characteristic that sets a suede finish apart from the Matte is a slight shimmer to the polish without a shine. Generally, the suede finish requires less maintenance than a matte because it is slightly more durable. I would still add a matte finish top coat for added durability. What people tend to like most about the suede finish is that it gives a smooth, luxurious look. Some people will also call this a Satin finish but satin is yet another polish finish to add to the list. Finding a happy medium between a Matte and Suede finish the satin look has a slight shine but no shimmer. If looking quickly it is easy to get these two mixed up or think they are the same finish. As you can see the Satin finish has an almost waxy look. 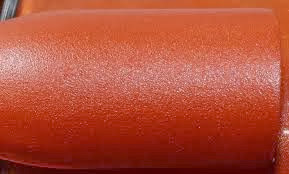 Over the last year, I have noticed this finish gaining popularity and a few polish makers have started offering a "wax" top coat that will give any polish this look. Thanks for stopping by and don't forget to check out my previous posts in this series where I break down the characteristics of a creme, matte, and shimmer finish. Happy Polishing!